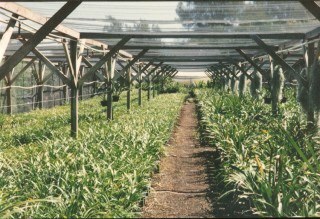 Casa de las Orquideas is a small family owned and operated orchid nursery with 24000 square feet of growing area, mostly under shade cloth, in Solana Beach, California. 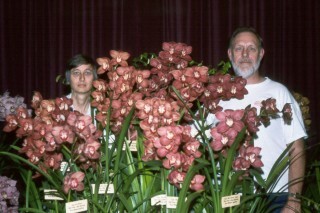 We specialize in outdoor growing Cymbidium hybrids, with a few Zygopetalum hybrids and other outdoor growing orchids. 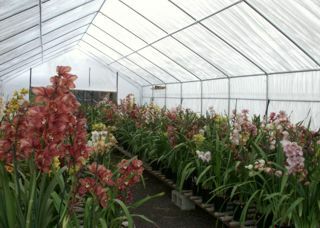 We are widely known for our high color cymbidiums and are constantly working to develop clear, clean colors suitable for outdoor growing with no special shade requirements. 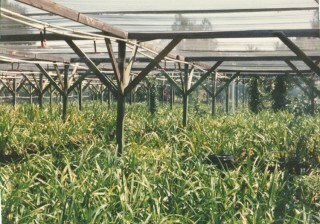 Our breeding is intended to provide new and different material for the amateur pot plant market and the serious collector. Our growing area gets cold in the winter, and all of the plants we offer for sale and exhibit in shows have been exposed to temperatures below 30 degrees without damage. 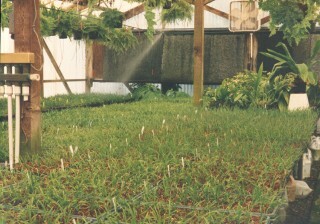 Display plants are grown under shade cloth, and are moved under open sided plastic cover when the buds start to open. The show and display plants get no special treatment. We can't grow the reed stem epidendrums in our area since they freeze under our shadecloth and we average about 8-10 nights a year with temperatures below freezing under the shade cloth.